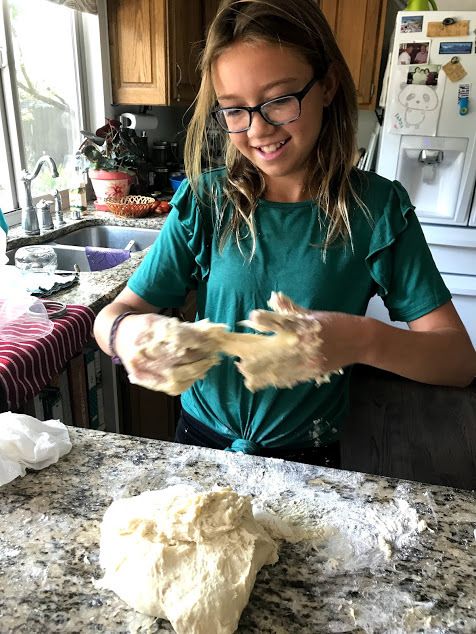 I mentioned in yesterday’s blog post that I was somewhat nervous about the prospect of making Aunt Lauren’s crescent rolls, bread-baking being something with which I struggle a bit. I was so nervous, in fact, that I stewed about it for some of the night. At one point, I had an epiphany. Jll had said that she was serving pulled pork for dinner. Why, these crescent rolls weren’t appropriate for pulled pork AT ALL. She went on to tell me that if I wasn’t inclined to make the rolls, it was not a problem at all. 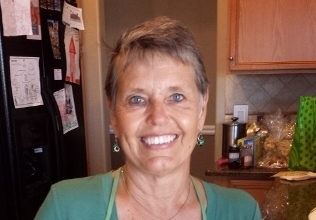 Still, I just imagined Dagny’s big brown eyes looking at me, and her saying, “Why, Nana? Why?”….. I am fully aware that the biggest problem I have making bread is a lack of patience. In the winter — when I am most likely to be making bread — my house is pretty chilly. As such, bread takes a very long time to rise. And if my recipe says let it rise until it’s doubled in bulk (about one hour), there I am in one hour frantically concerned that it hasn’t doubled in bulk. I am even liable to push ahead, ending up inevitably with a door stop, calling it a fail. In fact, if I could just talk myself into waiting until it is actually doubled in bulk, I would be fine. A chilly house was not a problem yesterday as Dagny and I began our roll-making process. 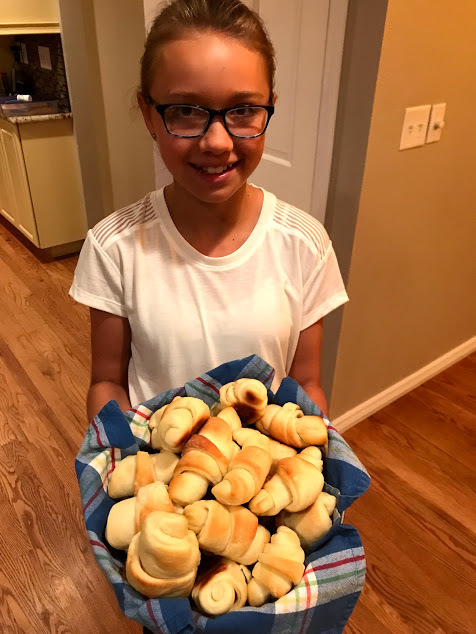 She proclaimed that she had watched her Aunt Lauren make these rolls many times, and she knew exactly what to do. And she was quite right. My brother-the-baker tells me that when yeast won’t ferment, it is much more likely to be from water that’s too hot for the yeast than too cold. I always use a thermometer to make sure my water is in the neighborhood of 110 degrees, something that my brother would find amusing. We mixed the yeast and the water and the eggs and the flour, and Dagny took over. “It’s just like mixing slime!” she proclaimed with delight…..
A bit different, I told her. I showed her how I learned to knead the bread. Once the bread was fully mixed, we put it in a bowl, and headed off to our next adventure: buying school clothes at Old Navy. And can I tell you that I don’t know when I’ve had more fun. Despite having all of these granddaughters, I have never — not once — shopped for clothes with any of them. 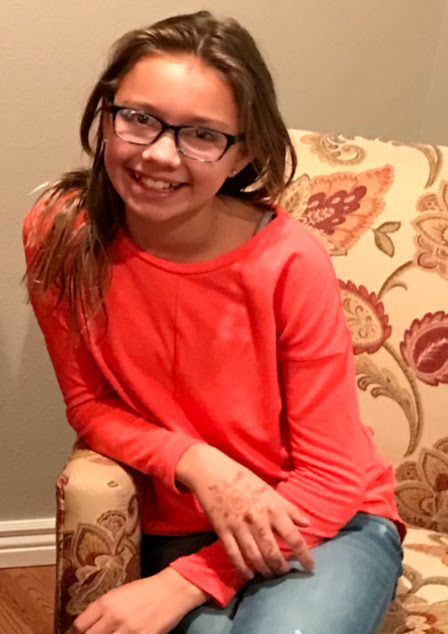 Dagny is 12, and has her own very defined taste in clothes. Comfort is her primary requirement. My kind of girl. When we returned, some hour-and-a-half later, the bread was doubled in bulk and ready to be rolled. This was the point at which Dagny took control. 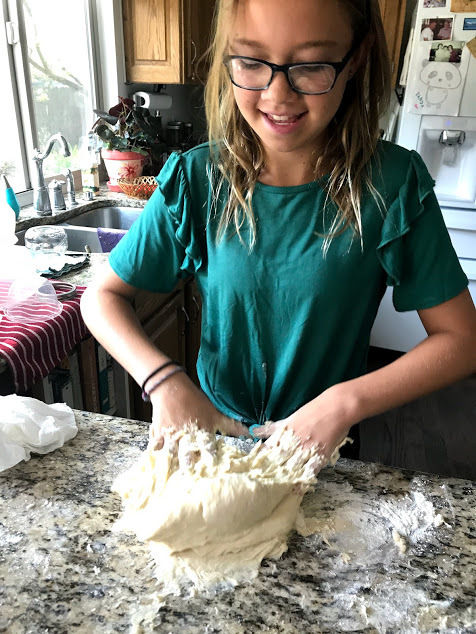 She divieded the dough in half and rolled one half into a circle. 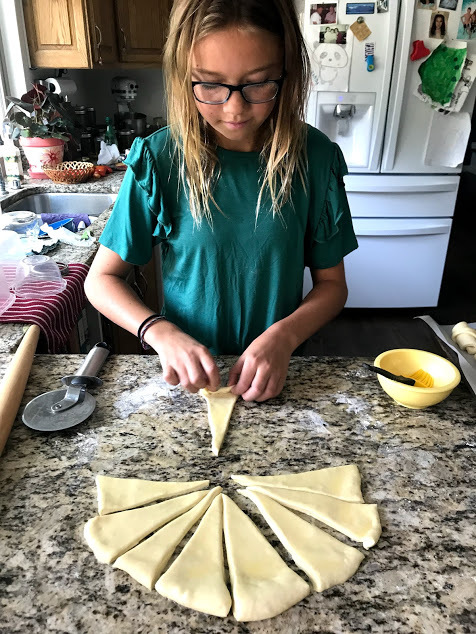 Modeling her Aunt Lauren, she then cut the dough into triangles, and rolled the triangles into perfect crescent shapes…..
She then did the same with the other half. Once they were baked and cool enough to pick up without burning her fingers, she popped one in her mouth. “They taste just like Aunt Lauren’s!”….. The rolls look amazing and Dagny has my heart. I can’t wait to hear what she picked at Old Navy. They really look so delicious!